The Economist has a look at the rapid growth prospects for electric vehicle sales - Electric cars are set to arrive far more speedily than anticipated. Improving technology and tightening regulations on emissions from ICEs is about to propel electric vehicles (EVs) from a niche to the mainstream. After more than a century of reliance on fossil fuels, however, the route from petrol power to volts will be a tough one for carmakers to navigate. The change of gear is recent. One car in a hundred sold today is powered by electricity. The proportion of EVs on the world’s roads is still well below 1%. Most forecasters had reckoned that by 2025 that would rise to around 4%. Those estimates are undergoing a big overhaul as carmakers announce huge expansions in their production of EVs. Morgan Stanley, a bank, now says that by 2025 EV sales will hit 7m a year and make up 7% of vehicles on the road. Exane BNP Paribas, another bank, reckons that it could be more like 11% (see chart). 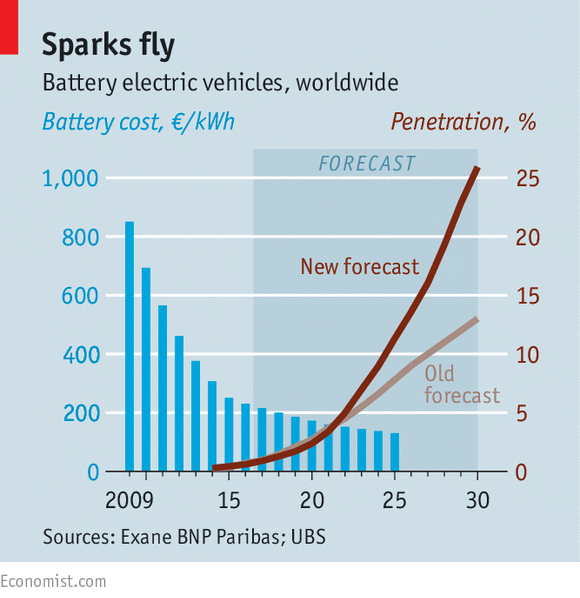 But as carmakers plan for ever more battery power, even these figures could quickly seem too low.